Those familiar with the iconic Mexican artist Frida Kahlo may associate her with her tempestuous relationship with fellow artist Diego Rivera, her sometimes controversial antics, or more obviously: Her deeply personal and captivating artwork. In Me, Frida; however, we see a softer, more vulnerable side of the revolutionary artist. 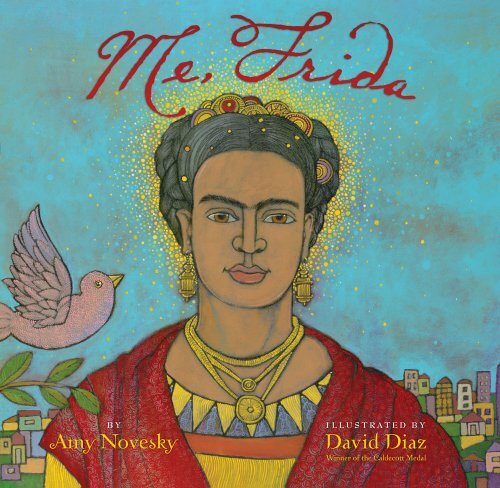 Using vibrant, dream-like illustrations, Novesky describes the time in Frida’s life when she leaves Mexico for the first time to accompany Diego to San Francisco where he has been commissioned by the city to paint a mural. While Diego finds the city inspiring and beautiful, Frida feels little and lost in this foreign city where she doesn’t have many friends and is unable to speak the language. It is only when Frida begins exploring the city on her own that she is able to find her voice and pursue her true passion of painting. Frida’s journey is beautiful and empowering and teaches us that we must never doubt our abilities or more importantly, our hearts.